We are now Open for the 2019 season. Give us a call to book your jump 252-678-JUMP. The Outer Banks of North Carolina is the perfect place for your skydiving dream to come true! No experience required and no major training involved. Skydiving is the thing to do! Have you ever wanted to jump out of a plane? Has skydiving been on your bucket list for years now? There is no better place to experience your first skydive than the beautiful Outer Banks of North Carolina, where human flight began. The Wright Brothers piloted the first powered airplane on the Outer Banks in 1903, coining the phrase “First in Flight” which has become synonymous with our area. 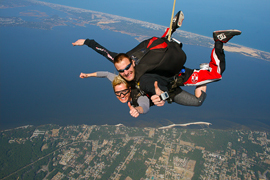 Your skydive will be one of the most memorable moments you will have on the Outer Banks. The spectacular scenery of our beautiful barrier island from your freefall and canopy ride will take your breath away. Well, that and jumping out of a plane! We also offer a HD video (for an additional charge) of the whole experience so you can share your skydive with friends, and relive the moment. Why not finally make your dream a reality and have your “First Flight” with us? 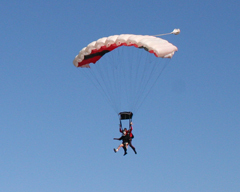 Skydive OBX is a proud member of the United States Parachute Association. Our tandem instructors are highly experienced and hold several certifications and excellent safety records. Safety is our number one priority. Feel free to bring your family and friends with you for your jump so they can share the excitement. Get ready to experience the thrill of a lifetime! Call or email us to make your reservation. We recommend booking at least a week in advance. Celebrate birthdays, anniversaries, weddings, or just a “let’s do it!” day by making this an experience you will never forget. Gift Certificates available. Makes a perfect gift! And what better way to celebrate a bachelor or bachelorette party? We offer discounts to groups of five or more. Our jumps are at the Dare County Regional Airport in Manteo. We are pleased to offer services to all of The Outer Banks. We are only a short drive from Corolla, Duck, Southern Shores, Kitty Hawk, Kill Devil Hills, Nags Head, Manns Harbor, Wanchese, Rodanthe, Waves, Salvo, Avon, Buxton, Frisco, Hatteras, Ocracoke. And surrounding areas. Make it a day trip with the family. The North Carolina Aquarium is a short walk away along with many other exciting things to do. Downtown Manteo is a short drive away.